With Diego's second birthday being on Saturday I needed to buy him some new treats to celebrate. I also needed to make a guinea pig food order, so I ordered some treats from www.pet.co.nz. After I had made that order, I got a call from my friend in Wellington who had also sent Diego a box of treats from the same website. I thought it would be great to film Diego's reaction to the new treats, as well as share them with you. If you want any of the treats reviewed in-depth, leave me a comment below and I can arrange that. This is my first time in front of the camera, so bear with my awkwardness, but if you want to see the video of Diego and I opening the treats, click here. These treats smell incredible! I wanted to give them a try myself, but resisted when I realised they contain chicken. These treats have chicken, parsley, peppermint oil and chicory in them to aid in keeping the dogs breath fresh, and also aiding in digestion as another attack towards bad breath. They are small sized, dog shaped biscuits which are easily eaten by Diego. These could be broken even smaller to be used for smaller dogs, or as a training treat. I haven't seen these treats in pet shops before, and I liked the idea of fresher breath. The packaging itself is a cardboard tube, which could be re-used or recycled which is another great thing about these treats. We recently tried the Plato Hundr's Crunch treats which Diego and Chico went mad for, so I had to try out some other Plato products. Most of the products were sold out when I was making the order, so I just picked up this one packet of Salmon Strips. These are 90% Salmon and are in a biscuit like shape. The biscuits are quite easy to break, and could easily be broken down into smaller pieces, but the treat itself seems quite chewy. These are very heavily scented of fish, and do make your hands smell fishy after touching them. I love feeding the dogs fish though because of the Omega 3 and 6 which makes the coat, and skin more healthy and luscious. Zeal is a New Zealand brand that makes amazing, healthy products out of New Zealand stock. Both of these treats are 100% animal products, with no extra ingredients or additives. We have tried a lot of the Zeal brand from when we received the Bow Wow Boxes last year, and Diego always has enjoyed chewing on them. 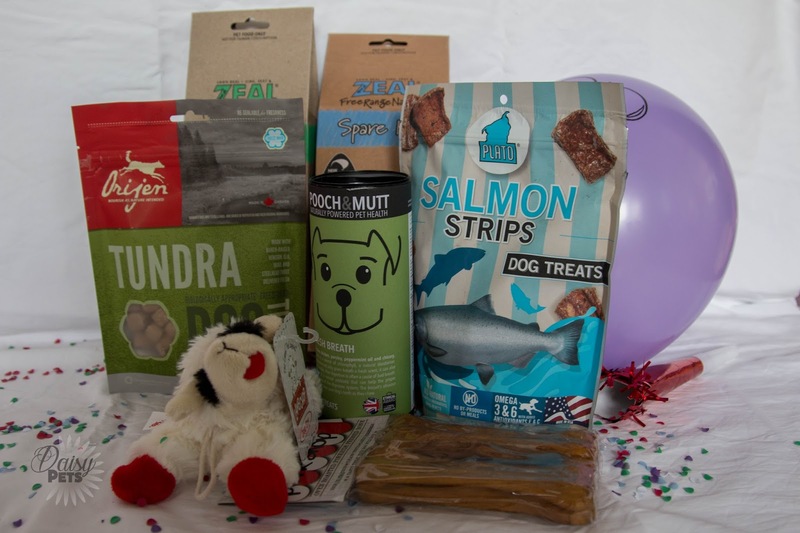 These are great treats to have lying around if you want to keep your dog busy for a few moments, or to stuff into anti-boredom toys to make them more challenging. I feed Diego Orijen as his main source of food, and have done since he was a puppy. I love how they don't use fillers, and the main ingredient is actual meat. When I saw that they made dog treats, I was over the moon. They also make them in a bunch of different flavours, but I went for the Tundra flavour as it was different to the other treats we were getting. These are smallish puffs, but can be broken down smaller if need be. They are quite dry and crumply when broken, and my sister described them like flaky cardboard. These are oven roasted porkhide, that has been pressed into a bone shape. I don't generally buy these for Diego myself, because I don't usually want to watch him eat a bone for as long as these would last, but he does enjoy them when he gets them. The one worry is if he doesn't break the porkhide into smaller pieces when chewing it, because if he doesn't it can become a long, sticky mess inside of him. I will probably use these when we are staying somewhere new when on holiday or staying at my fathers, as a way to distract him and give him something to do. That is all the treats that we got to celebrate Diego's birthday this year, make sure you do watch the video to see Diego's reaction to all the treats. We are celebrating his birthday all week, and have some other posts you may be interested in. Earlier in the week we made Pumpkin and Bacon Dog Treats, on Friday we are making a Birthday Cake, and this weekend we will be going down to Wellington to spend some time with friends and family and this will all be documented Vlog style.